Since it's become acceptable for intelligent grown-ups to read and engage in young adult fiction, it was only a matter of time before we could start getting into children's books, as well. Both Slate's Troy Patterson and Jezebel's founding editor Anna Holmes have recently revisited books from their childhoods, although — surprisingly — neither approached them from a sentimental angle. Instead, they've chosen to discuss the kids books that they've always hated, so let's join them. Alexander is SUCH A PILL. He's graceless and ungracious and self-pitying to an entitled extreme. You know, when Mr. Raccoon has a very bad day—in "The Unlucky Day" of Richard Scarry's Bedtime Stories—when Mr. Raccoon's bathroom faucet breaks and his car motor explodes and Warty Warthog sticks him with the check at lunch and he goes back home to find that his house has flooded, despite Mr. Fixit's having been there all day, alone with Mrs. Raccoon—when these misfortunes befall Mr. Raccoon, he remains stoic and takes it all in stride. Meanwhile, Alexander, being a terrible, horrible brat, narrates a tedious catalog of petty gripes. There are way more children's books that I love out there than children's books that I hate, but exploring as far back as my memories will go, I've discovered that I never really liked — and I'm sorry for this — Maurice Sendak's In the Night Kitchen. And now it's your turn. 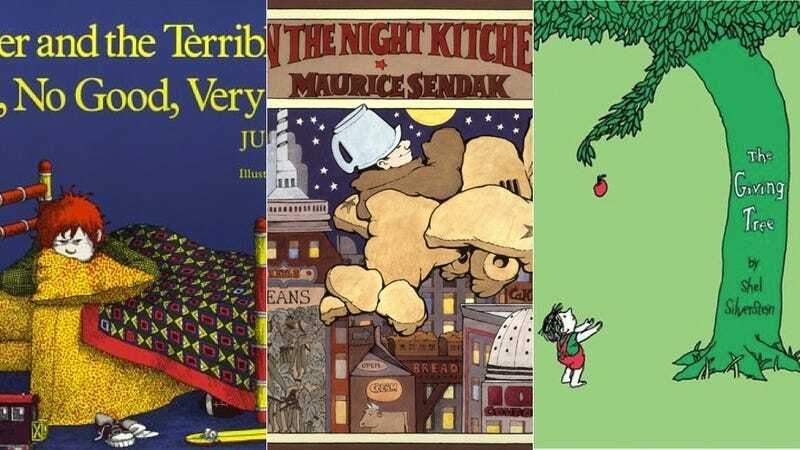 What children's books have you always hated?